London 2012: Phelps Sets New Olympic Record With 19 Medals; America's Schmitt Wins Gold : The Torch The U.S. men's swimming team has won the 4x200m freestyle relay, in a race that also gave Michael Phelps a record 19 medals in the Olympics. He netted his 18th, a silver, earlier in the day. Also netting a gold was American Allison Schmitt, who won the women's 200m freestyle. 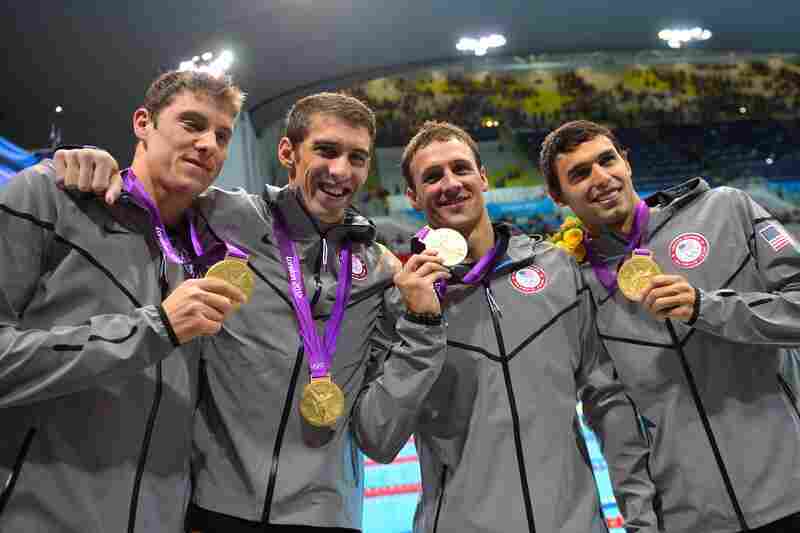 U.S. swimmers Conor Dwyer (left), Michael Phelps, Ryan Lochte, Ricky Berens poses on the podium with their gold medals after winning the men's 4x200m freestyle relay final at the London 2012 Olympic Games. U.S. swimmer Allison Schmitt cheers after winning the women's 200m freestyle final. 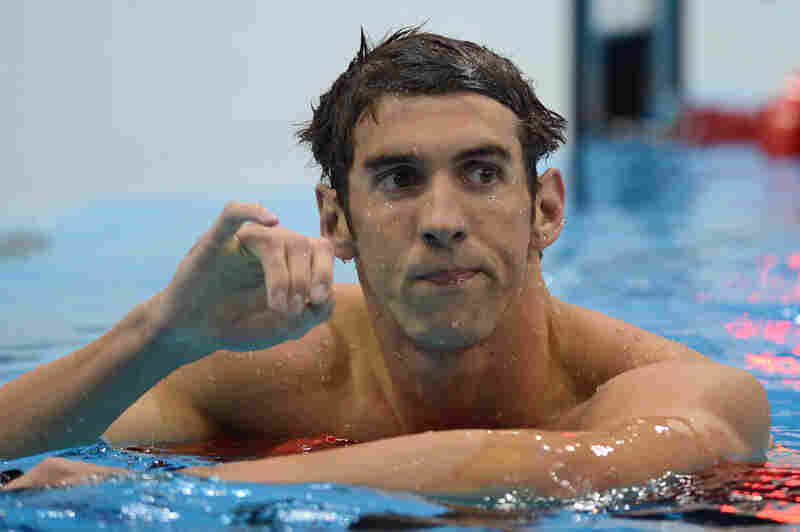 Swimmer Michael Phelps reacts after finishing second in the men's 200m butterfly final at the London 2012 Olympic Games. 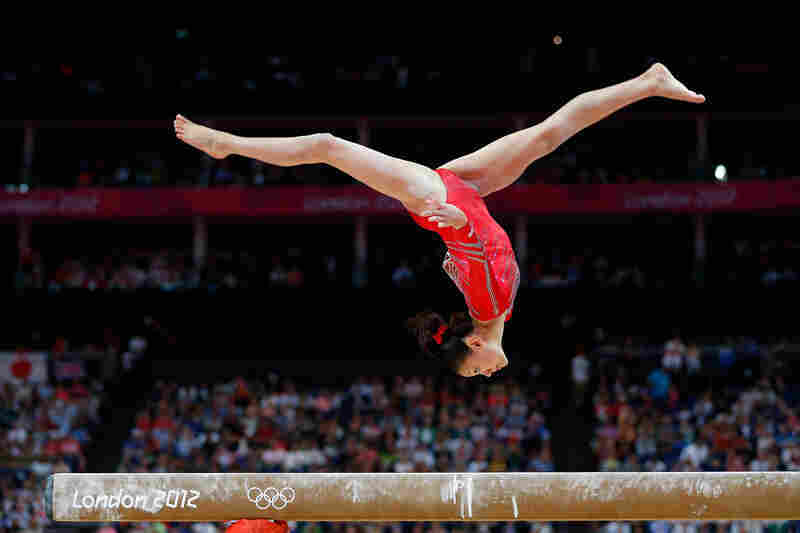 U.S. gymnast Kyla Ross competes on the balance beam in the Artistic Gymnastics Women's Team final. The U.S. team won gold. 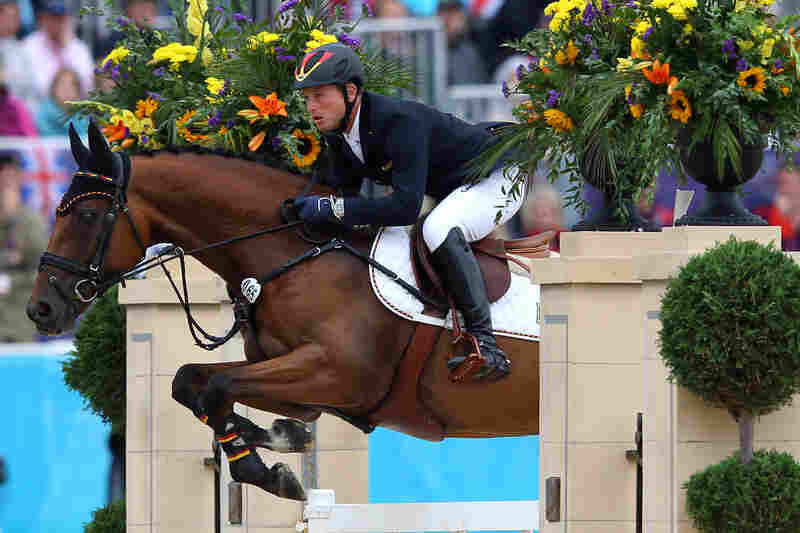 Michael Jung of Germany riding Sam negotiates a jump in the Individual Jumping Equestrian Final. Jung won the event. 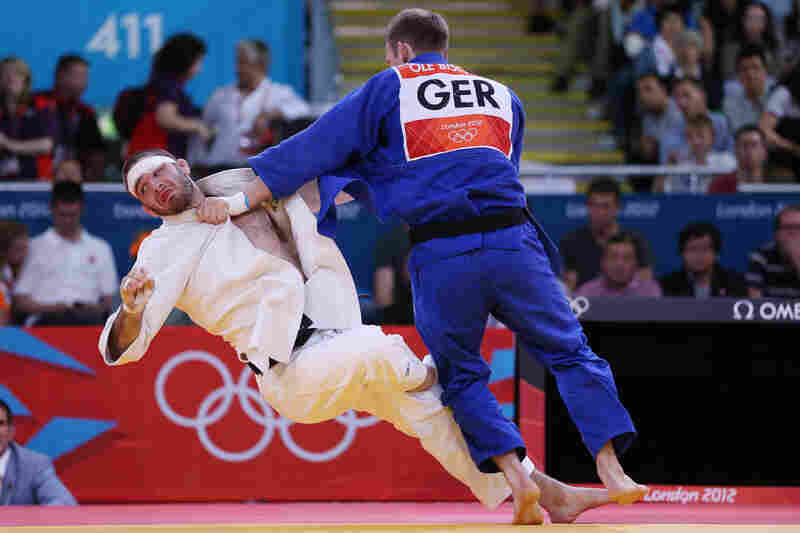 Travis Stevens of the United States (in white) competes against Ole Bischof of Germany in the Men's -81 kg Judo semifinals. Stevens lost the match. 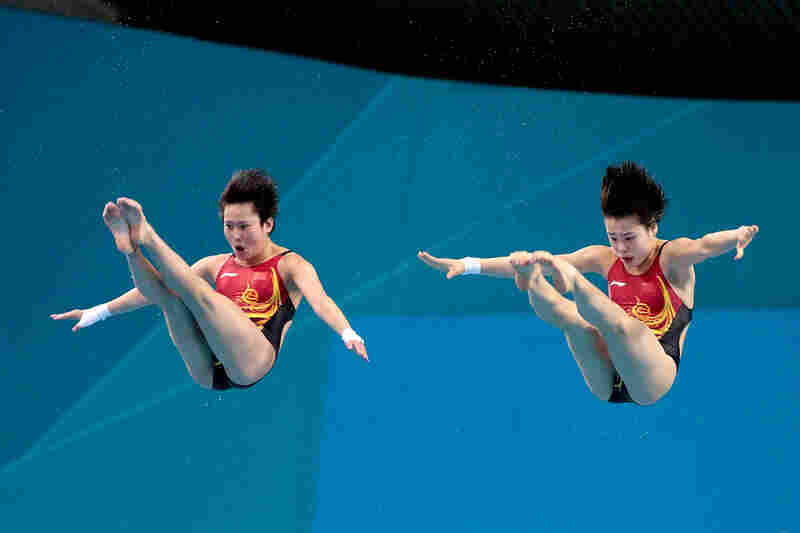 Chen Roulin and Hao Wang and of China compete in the Women's Synchronised 10m Platform Diving. Roulin and Wang won the event. 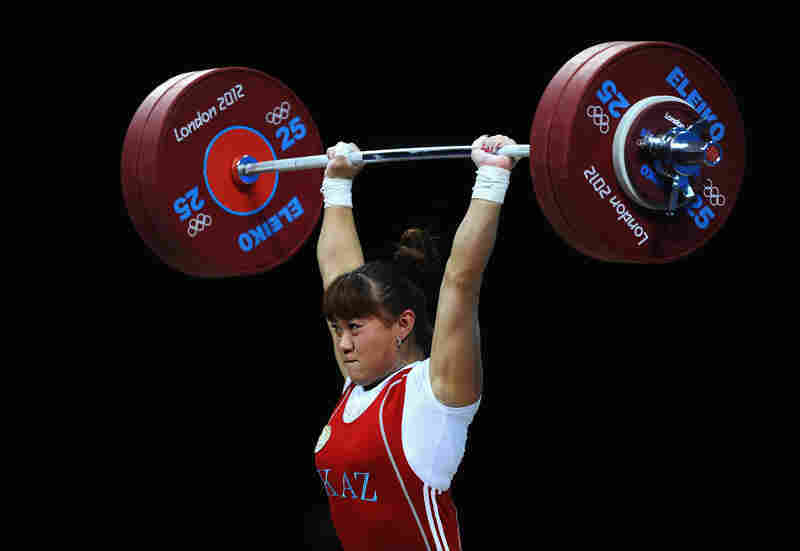 Maiya Maneza of Kazakhstan competes in the Women's 63kg Weightlifting final. She won the event. Slovenia's Urska Zolnir (in blue) competes with China's Lili Xu during their women's 63kg judo contest final match. Zolnir won the match. 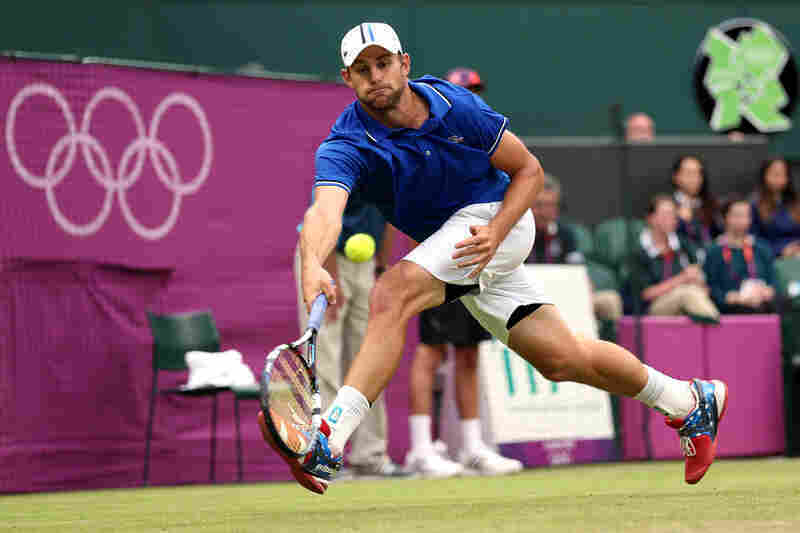 Andy Roddick of the United States returns a shot to Novak Djokovic of Serbia during the second round of Men's Singles Tennis. Roddick lost the match. 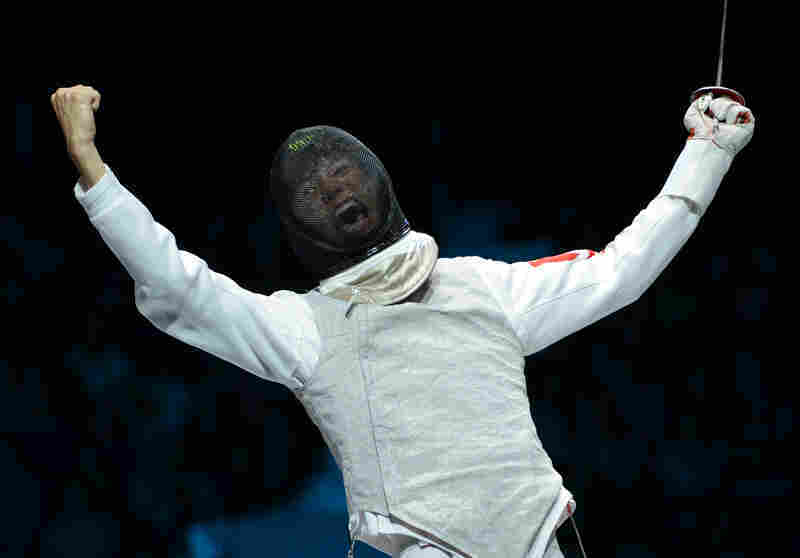 China's Lei Sheng celebrates his victory over Egypt's Alaaeldin Abouelkassem at the end of their Men's foil gold medal bout. The U.S. men's swimming team has won the 4x200m freestyle relay, in a race that also gave Michael Phelps a record 19 medals in the Olympics. He netted his 18th, a silver, earlier in the day. Update at 4:05 p.m. EDT: For the relay final, the American team swam in the fourth lane, next to their greatest rivals, the French, who posted the fasted qualifying time. The French are led by Yannick Agnel, who soundly defeated Ryan Lochte and others in the men's 200m freestyle Monday. Perhaps spurred on by that defeat, Lochte sprang out to a lead, swimming the first 50 meters in 51.17, fastest among starters. He maintained that edge for the first 100 meters and turned over a one-second lead to Conor Dwyer, with Germany, Australia, and France trailing. Dwyer preserved the lead before giving way to Ricky Berens. By that time, France was surging, along with China. But anchoring the race was Phelps, who was denied a victory earlier by what looked like an irresolute approach to the wall. But he would not be denied this time, as the U.S. team finished with a dominating 6:59.70 time — beating the field by at least three seconds. France took the silver medal at 7:02.77, and China the bronze at 7:06.30. Michael Phelps has won a silver medal in the 200m butterfly at the London 2012 Olympics, coming in second to Chad Le Clos of South Africa. Phelps was timed at 1:53.01 to Le Clos' 1:52.96. The silver brings Phelps' total to 18 Olympics medals, tying the record held by gymnast Larisa Latynina. Phelps led the race's first 100 meters, then faded a bit in the final leg. American Tyler Clary took fifth place, with a time of 1:55.06. His race came just after the women's 200m freestyle final, in which American Allison Schmitt won a gold medal. 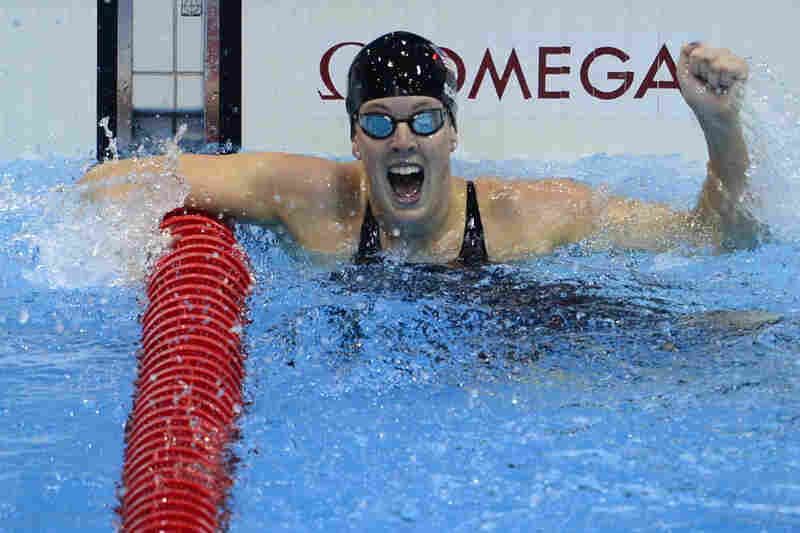 In that event, Missy Franklin took fourth place, with a time of 1:55.82 — a single one-hundredth of a second behind Australia's Bronte Barratt, at 1:55.81. Schmitt, 22, set a new Olympic record with her time of 1:53.61. It is the first gold medal for the Pittsburgh, Pa., native. Camille Muffatt of France won the silver medal. For Phelps, the silver medal in the 200m butterfly ended a chance for an unprecedented "three-peat" gold medal performance by a swimmer in the same Olympic event. Update at 3:28 p.m. EDT: Phelps has a chance to break Latynina's record later today, when he swims in the 4x200m freestyle relay. "Do I think I am still the greatest Olympian?" she said in an interview with Yahoo! Sports translated by a Russian gymnastics federation official. "Why yes, but that is my opinion."